Celebrating its second year anniversary, Art Connection – Rhode Islands’ primary mission is to connect artist and donors to community service organizations through the placement of original artwork. By facilitating this exchange, Art Connection – RI hopes to propagate the joy art brings to people’s lives. Bringing art to life! Viewing paintings and sculpture in a museum is a fine way to pass an afternoon, however, taking art and transforming a room into an inviting, inspiring, and affecting environment for the living of everyday people is the true calling of artistic expression. Instilling a meaningful purpose to objects of art that moves beyond the static exhibition and into a dynamic vitality. In celebration of their 2nd Anniversary, three distinguished members of the Rhode Island arts community will be presented with The Iona Dobbins Award. 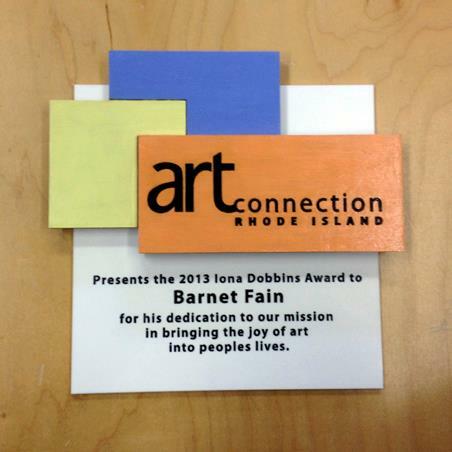 Designer, Gail Ahlers, is proud to have been commissioned by Art Connection -RI, to design and craft their custom awards from recycled and sustainable materials. As Gail’s personal mission is to create joy, Ahlers Designs expressly aligns itself with Art Connections’ worthy purpose of art bringing joy to people’s lives.